The holiday clock has started. Already, you’ll find that most big stores are putting out their Christmas items. You’ll see commercials on TV enticing you with the “perfect gift for that someone special.” This is the time that folks who like to plan ahead spring into action. There are probably already a few people who have already finished all their Christmas shopping. For everyone else, there is a lot to get done and it all starts with getting the clutter out of your house. That’s where Junk King Contra Costa can make a huge difference. Junk King Contra Costa is part of a national chain of decluttering experts. They’ve perfected a business model that is dedicated to keeping homes, apartments, businesses and even vacant lots clear of all kinds of rubbish. A lot of what people want to get rid of can be considered outright trash. That doesn’t always mean it can fit into a trashcan. For that kind of overflow, you need to bring in the team from Junk King. Junk King sets up their junk removal sessions with two strong movers. This is a team with a lot of experience with lifting and loading. You don’t have to tell them to “lift from the legs and not the back!” They are also great when it comes to taking things apart in order to load it onto the truck. They haven’t met a swing set or pool table they couldn’t take apart in no time at all. 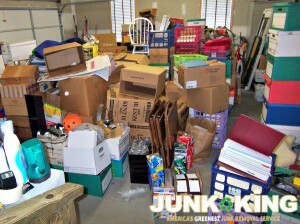 All you have to do is decide what you want hauled off by Junk King. Although you might have a general idea when you call to set up your appointment, you don’t have to lock down that final list until the crew shows up for the appointment. That is when they have to look everything over to estimate how much space it is going to fill on the back of the truck. Once you agree to that price, the crews will get busy. Before you can say, “Happy holidays,” they’ll have everything you want gone loaded onto the truck. It is just that simple. Start your holidays off right with a house that is totally free of clutter thanks to Junk King Contra Costa. This entry was posted in Contra Costa Junk Removal and tagged clutter, holidays, Junk King, junk removal on October 31, 2017 by Junk King. Last updated October 31, 2017 .